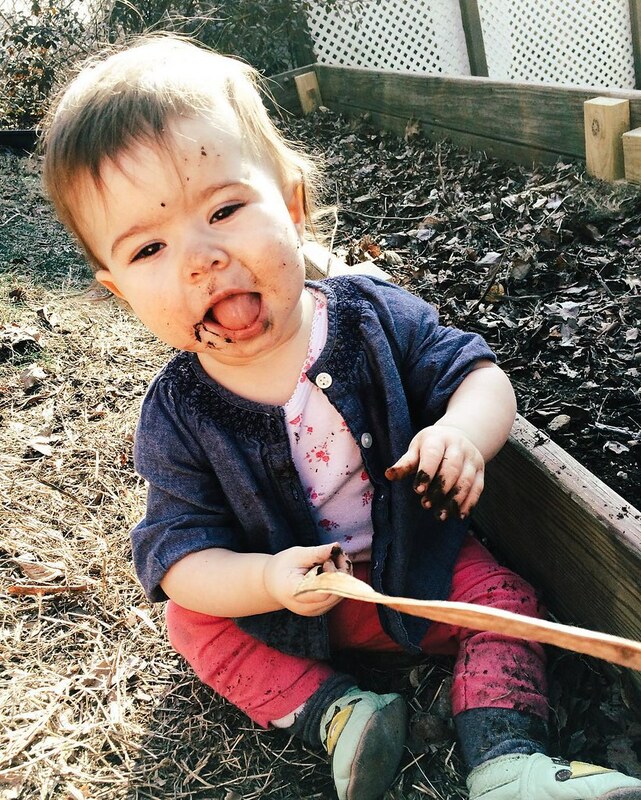 Filling her dirt intake quota. For years and years, I've wanted a large home garden. 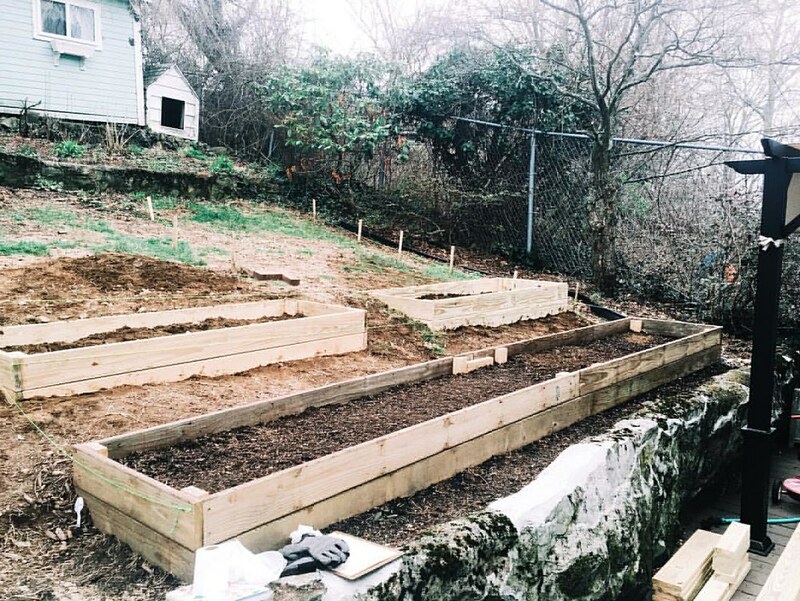 In my more wild imaginings (or so I have come to realize), I saw this eventual garden as producing enough food to feed our family for the entire year (ha! that was a good one!). My previous gardening experience has essentially all been in my head. I did some container gardening back in Bethlehem (nine basil plants and some lovely morning glories) but nothing to speak of since then. 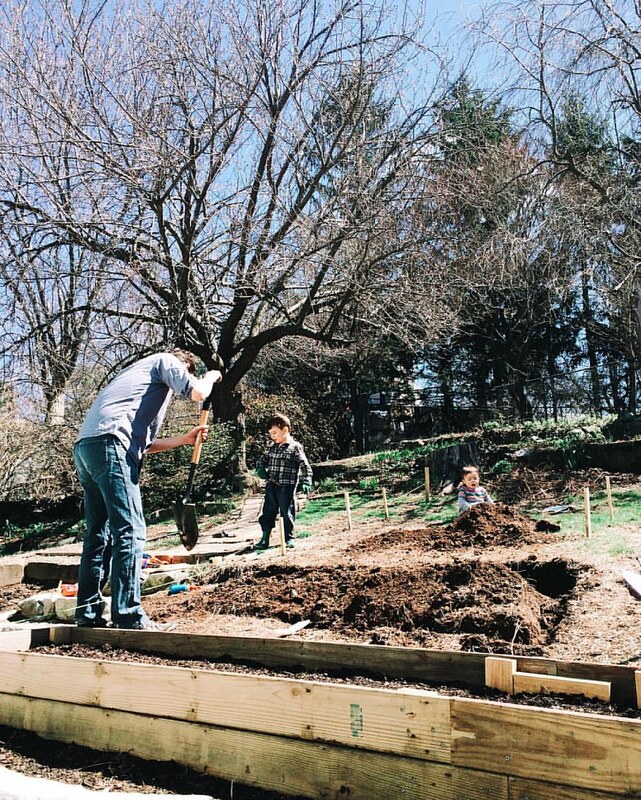 Now that we own a house and have a real yard, the dream is slowly becoming reality, with a fair bit of missteps and knowledge gaps along the way. 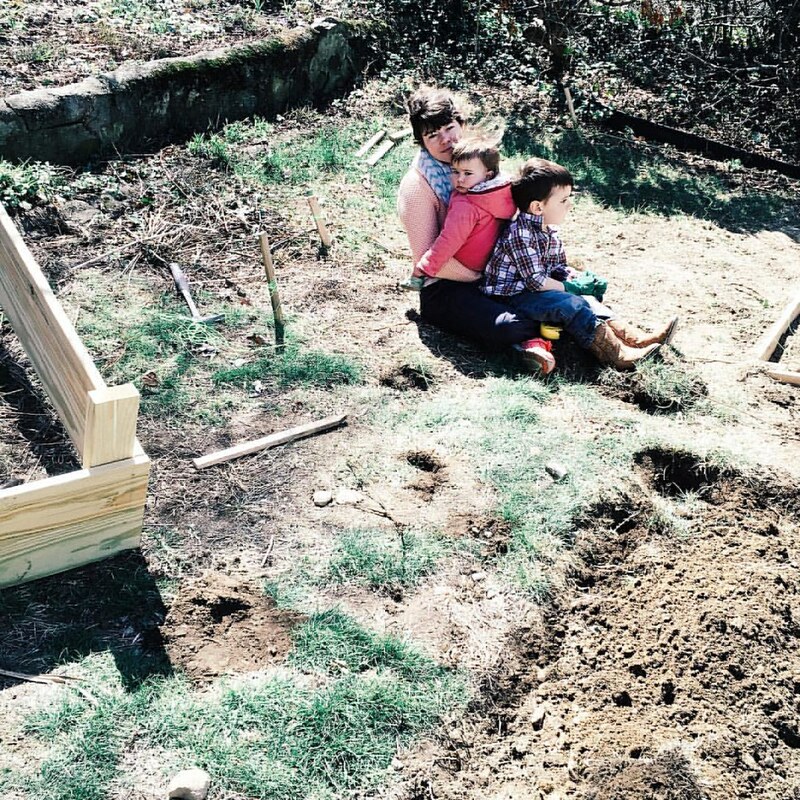 Back in the fall, my soon-to-be-sister-in-law Heather and I sat down and planned out the bed shapes and sizes then got to work digging out the space for the largest bed which is about 2.5 feet by 18ish feet. Then we got my already-brother-in-law to build the actual bed frame with us assisting. And by us, I really mean Heather. Soon after it was done, the weather turned, so I covered the bed over with dead leaves and left it for the winter. I have since learned that I probably should have planted a winter cover crop that would have survived in zone 5. A yard full of dirt to play in, and all they want to do is sit in my lap. The long bed and two of the four finished short beds. I should have ordered my seeds in January; I didn't get around to it until mid-March. Our last frost date is around May 4, so by the time the seeds came in, I was already behind in getting the spring and slow-growing summer seedlings started. From Annie's Heirloom Seeds, I ordered: regular tomatoes, two types of cherry tomatoes, carrots, basil, spinach, chives, chocolate bell pepper, cabbage, lettuce, broccoli, onions, peas, migrogreens, cucumber, parsley, arugula, cauliflower, butternut squash, red potatoes, sweet potatoes, and a collection of companion flowers. First seedling sighting: a cauliflower! I direct sowed the microgreens, spinach, arugula, broccoli, and peas. The tomatoes, peppers, cabbage, cauliflower, basil, chives, and onions were started indoors. With the onions as the one exception (which despite two attempts, never sprouted), everything germinated well enough. However, after a couple of weeks, the indoor seedlings starting getting real leggy. I did some research online and determined that they weren’t getting enough sunlight from the window sill they were sitting on. So, Piercen rigged up some grow lights left over from an old fish tank and put them on a rack above the seedlings in the laundry room. 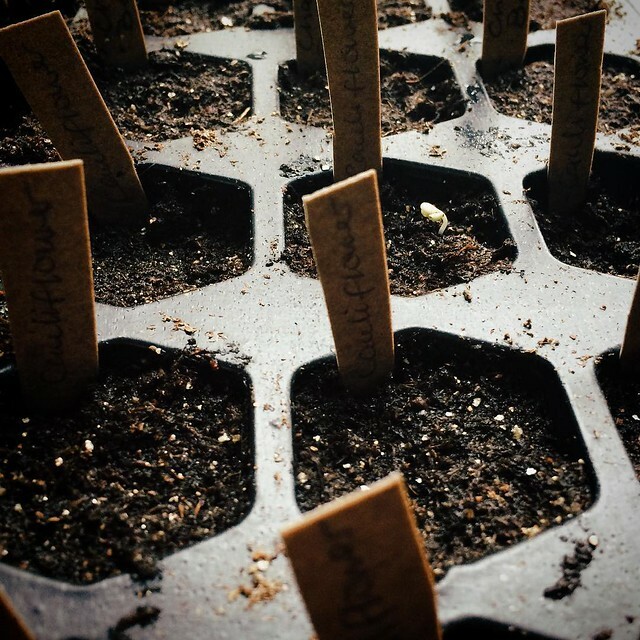 Not the ideal situation, but it proved sufficient enough to get the seedlings through until the daytime temps warmed up so that I could set them outside for a couple of hours each day. Of course I forgot that plants raised indoors need to be hardened off before getting direct sunlight so they all got a bad case of sunburn that first day out. 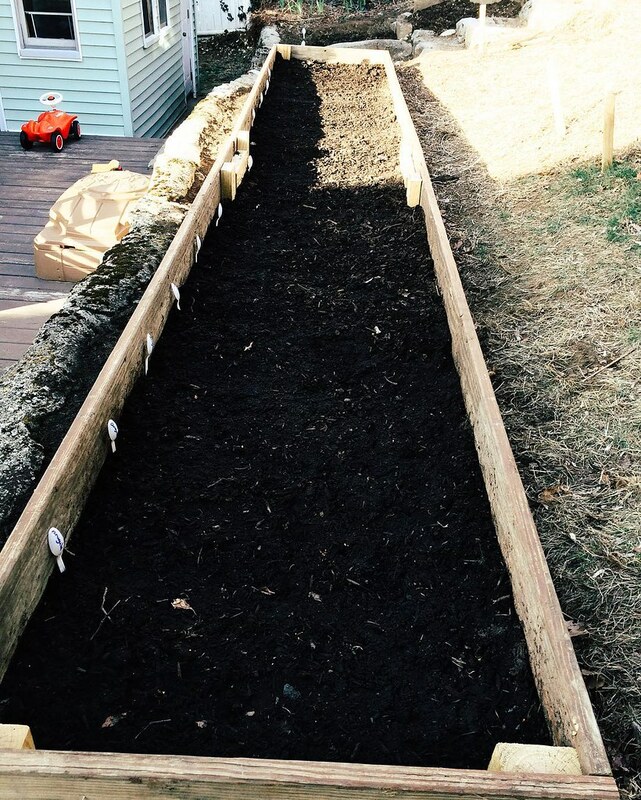 Concerning the raised beds, as the framing was finished on each, I tilled up the soil and added purchased organic garden soil, cow manure, and mushroom compost. We are doing our own composting but with our long winters, it takes a full year for a pile to truly cook down enough for direct use, so I’m saving the one we had active from August to November of last year and will use it on next year’s garden. For the pile we are currently contributing to now, I will stop adding to it in October (any later, and it could become too frozen to give a final stir; a mistake I made last year), and will save it for use starting in spring 2018. Biggest lesson over all: I love gardening. Like really love gardening. Like I may like it just as much as selling vintage--something I never thought I'd say. Not that I'm going to stop with the vintage, but the shops have certainly been pushed to the back burner for a while.